Emil Grondal is due back in action for Panthers. 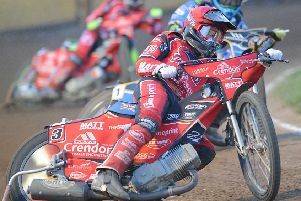 Peterborough Panthers team boss Carl Johnson is tipping fit-again Emil Grondal to be a trump card in the SGB Championship title chase. The Danish racer slots back into the table-topping side following a seven-week lay-off with serious injuries sustained in a horror crash in his homeland. Panthers skipper Simon Lambert will also race for King's Lynn. And Grondal, who came through a practice session at the East of England Arena following Panthers’ top-of-the-table triumph against Lakeside a couple of weeks ago, will race at reserve following a change in averages. His 5.04 figure remains the same, but he has now been leapfrogged in the Panthers pecking order by skipper Simon Lambert, who rises into the main body of the team for home dates against Scunthorpe tonight (July 13, 7.30pm) and Sheffield on Sunday (July 15, 5pm). Johnson said: “First and foremost it is great to have Emil back and we’re hopeful he can pick up from where he left off. “He had a great start to the season and scored plenty of points in the main body of the team. The fact he comes back in at reserve could really work in our favour. “We all know what he can do around the Showground and coming back to two home meetings in three days should really get him up to speed after his spell out. “Always having a strong rider at reserve was very much in our thoughts when putting the team together last winter. Grondal was initially replaced by Edward Kennett only for the former British international to suffer a badly fractured arm in a long track crash before even turning a wheel in Panthers’ colours. Club chiefs then opted to draft in Ellis Perks as a 28-day replacement with his deal coming to an end following their repeat success in the SGB Championship Fours at the beginning of this month. While Panthers have certainly had their share of injury problems this season, the same can also be said of the two teams they will face in the coming days. Scunthorpe are likely to be without two riders - Stefan Nielsen (broken leg) and Jason Garrity (finger damage) – but long-term casualty, number one Steve Worrall, is set to be back after also breaking his leg. But Johnson stressed: “Who is, or isn’t, riding is not something we will worry about too much. Our focus will be on our boys and our performance as it always is. Panthers captain Simon Lambert has been snapped up by SGB Premiership club King’s Lynn. He will join the Stars as a 28-day replacement for injured reserve Kasper Andersen.